Are punitive damages available to plaintiffs who prove willful employment discrimination under the Connecticut Fair Employment Practices Act, Conn. Gen. Stat. 46a-60 et seq.? That question is currently before the Appellate Court in Tomick v. United Parcel Service, AC 35896. 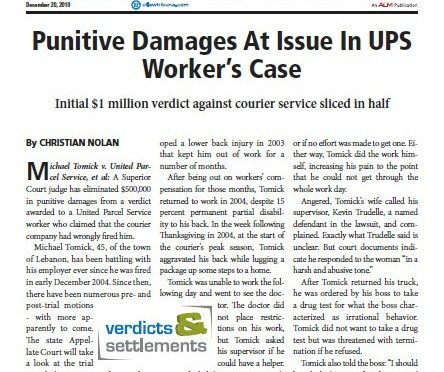 Michael Tomick v. United Parcel Service, et al: A Superior Court judge has eliminated $500,000 in punitive damages from a verdict awarded to a United Parcel Service worker who claimed that the courier company had wrongly fired him.